Need a paint job but can’t decide between eggshell and satin finishes? When it comes to painting your house, choosing the best type of paint is indeed as important as choosing the right color. In this article, we will help you understand the difference between eggshell and satin paint. Eggshell paint, as the name suggests, has a finish similar to that of a real eggshell. It is smooth and is slightly reflective or glossy; its luster is about 10% to 25%. It can give any surface or item a heritage style look. Once it dries, eggshell paint is fairly durable. It provides a protective layer to a surface and does a great job hiding dents, cracks, and other imperfections. It is easy to clean and maintain. Eggshell paint is best suited for areas where there is not much foot traffic and dirt build-up. It can be used to paint ceilings and walls in bedrooms, living rooms, and dining rooms. Some manufacturers also have eggshell paints that can be used to paint the exterior walls, windows, and front doors. It can also be used to paint woodwork and home accents. Additionally, eggshell paint is not recommended for the kitchen, bathroom, and kids’ room. It easily shows scuffs and may not be able to withstand the moisture. On the other hand, satin paint gives any surface a soft, silky, or velvety finish. It creates a muted glow which gives any surface greater depth. Satin paint has 25% to 35% luster, giving any room an elegant luster. Satin paint is extremely durable. It can withstand dirt, grime, and even moisture. Once dry, it can even be washed (scrubbing is not recommended). Because it of its durability, satin paint can be used to paint walls in areas where there is a lot of traffic or that are more prone to wear and tear. It is great for the walls in bathrooms, kitchens, foyers, hallways, family rooms, kids’ rooms, and laundry rooms. It can also be used to paint windows, shutters, door trims, or exteriors. Like any other type of paint, satin paint has disadvantages. Because of its sheen, it does not have the capability to hide cracks, holes, dents, and other imperfections. Achieving an even finish when making touch-ups can also be difficult. What, then, is the difference between eggshell and satin paint? Eggshell paint has a finish that is similar to that of a real eggshell. It has a luster of about 10% to 25% and generally gives your room a heritage style effect. Satin paint, on the other hand, has a velvety or silky finish. It has a gloss of about 25% to 35% and can give your room a classy sheen. Because of its “eggshell effect,” eggshell paint does a great job of hiding imperfections on surfaces. Conversely, satin paint cannot conceal imperfections and uneven applications. In terms of durability, eggshell paint is less durable than satin paint. 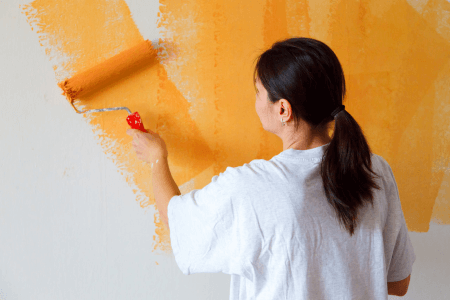 Eggshell paint is recommended for low-traffic areas and places where there is less dirt build-up because it easily shows scuffs. Satin paint, on the contrary, can be used in high-traffic areas, exterior walls, and rooms that are more prone to wear and tear such as bathrooms, kitchens, hallways, kids’ rooms, and laundry rooms as it can withstand grime, dirt, and moisture.